We have less than a week to go until we submit Above to the TERMINUS conference and we’re all very excited about it. We’ve also decided to launch a Steam Greenlight campaign which, if successful, will allow us to put our game in the hands of players everywhere. Once we’ve firmed up some art work and general marketing stuff we’ll be pushing that out and asking for support. This week my main focus was to build level 4 which was to serve as an introduction to new mechanics that players would be seeing in level 5. I believe that most of it worked out pretty well because I use simple “filler” puzzles as a way to get the player to think about the new mechanics. For example, I put a drag block in that must be pushed onto a weighted switch a couple of floors below. This switch activates a fan platform that will allow the player to progress. 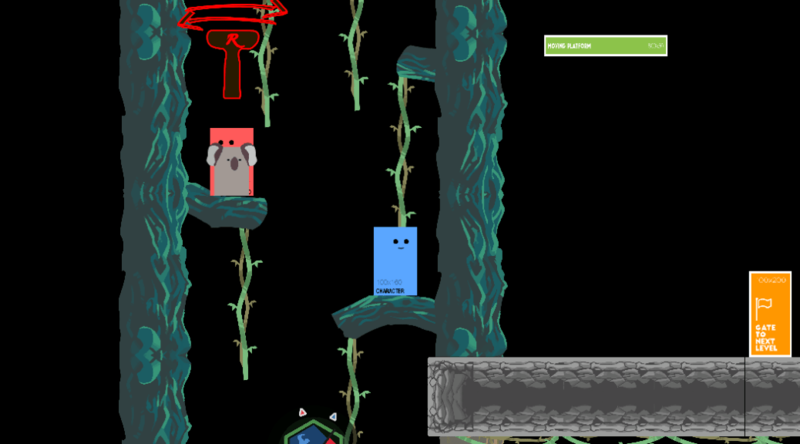 It acts as a gate mechanic, forcing the player to learn how to use the fan platforms before allowing them to continue to more complex levels which require mastery of the fans. This week I also created a fire fly particle system that will show the active checkpoint. In addition, I created the level selector which allows play testers to quickly jump from level to level. This was required by our instructor for school but we can see it being useful for our own play tests as well. Lastly, I added on a wait time for our moving platforms which greatly increases their usability. Continued to create and replace prefabs with new artwork. Added a level selector to enable quick play testing in our builds. Created the basic character animations and imported them into Unity. Added an idle/wait time to the moving platforms, making them easier to get on and off of. Revamped the tutorial text pop ups.